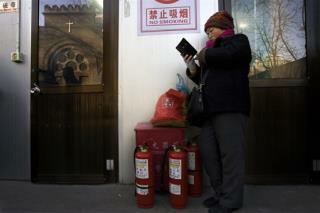 (Newser) – Despite government restrictions, Christianity in China is widespread and growing. Authorities typically look the other way, occasionally applying pressure that only seems to spread religion's influence, reports the Economist. Most of the Protestant "house churches" consist of 25 people—the largest legal gathering—where new Christians lead newer converts in bible study. "In China, the 2-year-old Christian teaches the 1-year-old," says a pastor.